Developed over the last three years QuickCAM’s CNC manufacturing software is built on the most modern software platform and incorporates the most advanced features for this industry. 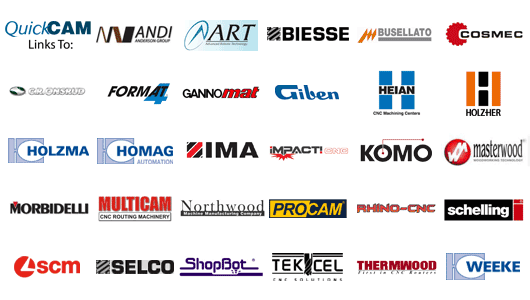 Typical brands: Anderson, Art, Biesse, Busellato, Cosmec, CR Onsrud, Format4, Gannomat, Giben, Heian, Holz-Her, Holzma, Homag, IMA, Impact, Komo, Masterwood, Morbidelli, MultiCAM, Northwood, ProCam, Rhino, Schelling, SCM, Selco, Shop-bot, Tekcel, Thermwood & Weeke. In a busy factory there can be many machines and it is essential to manage them all effectively and efficiently. QuickCAM will create the machining programs in a dedicated format for each machine in the factory while accounting for various machine types, languages and different tooling configurations . The strategy taken for delivery g-code programs and instructions to machines can vary. To be able to direct certain cabinet parts to certain machines based on processes required is an obvious one. Some shops duplicate data to a number of machines so that for example during a night shift and a machine goes offline jobs orders can be process on the available online machines without having to stop production and reprogram. No waiting it’s automatic. Even in the best run factory things can change and things can go wrong. When this happens you need to react quickly and with a minimum of fuss to maintain production. In this event, where you need to change the production paths, QuickCAM manufacturing software will make the process simple and easy without having to re-run the program. Therefore, taking the stress out of the situation.